Visiting New York has been on my bucket list for years and it's finally happening! We are flying out tomorrow morning, so today I want to show you the makeup that I'm bringing with me. I'm trying not to bring too much as I'm bound to buy some makeup in Sephora when I'm over there, but this is about as minimal as I get! I also focused on bringing products that aren't too heavy because I need to keep room and weight in my case for shopping! My current favourite base combination is Huda Complexion Perfector paired with Nars Radiant Longwear Foundation. I'm just obsessed with this foundation because it's so long-lasting on my skin and it adds radiance but doesn't highlight my pores or fine lines. The Huda primer hydrates my dry skin without feeling greasy it really doesn't feel like I have a lot of product on my skin. Charlotte Tilbury The Retoucher is perfect for both my under eyes and for concealing any redness so it's the only concealer that I need to bring. Being the highlight addict that I am, I'll be bringing a few options: a mini Cover Fx Custom Enhancer Drops, theBalm Mary-Dew Manizer and Huda Beauty 3D Highlight Palette, which will cover both my blush and bronzer/contour options too. Anastasia Beverly Hills Brow Definer is perfect for quick and easy, defined brows so that's an obvious choice. 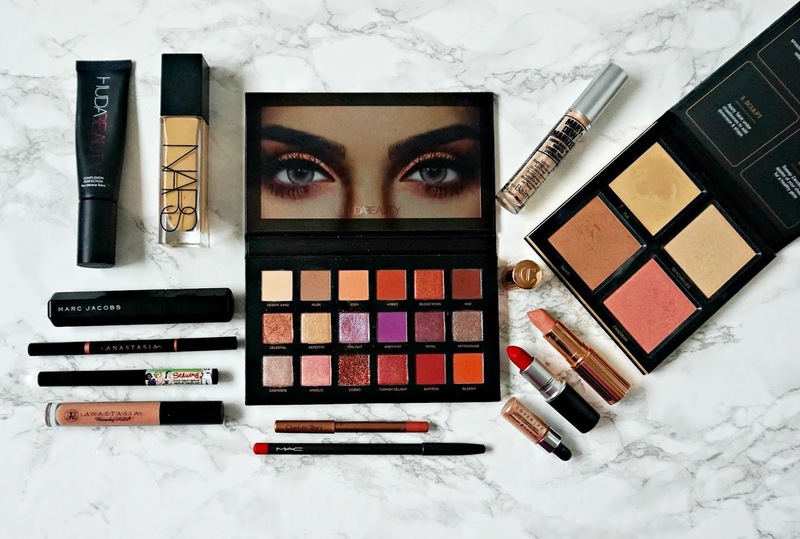 I've shocked myself by deciding to bring only one eyeshadow palette and that is Huda Beauty Desert Dusk because it contains a variety of finishes and shades, suitable for both day and night! (review here) To line my eyes, my current obsession is theBalm Schwing Liquid Liner - it's so long-lasting so I know that I can rely on it and Marc Jacobs Velvet Noir Major Volume Mascara is perfect for the false lash look that I love! I'm going a little bit extra with my lip options! Charlotte Tilbury Pillow Talk lip liner is a must because it's so close to my natural lip colour. That will work with Anastasia Beverly Hills Undressed Lip Gloss and Charlotte Tilbury Kim K-W lipstick. My red lip option is MAC Ruby Woo lip liner and lipstick because it's the perfect red and really long-lasting. Am I being excessive? Do you usually bring a lot of makeup on holiday? I'd love to hear! Oh and if you have any New York tips, please do share them in the comments below! I won't be posting again for around 10 days but I'm sure I'll have a haul to share with you then!